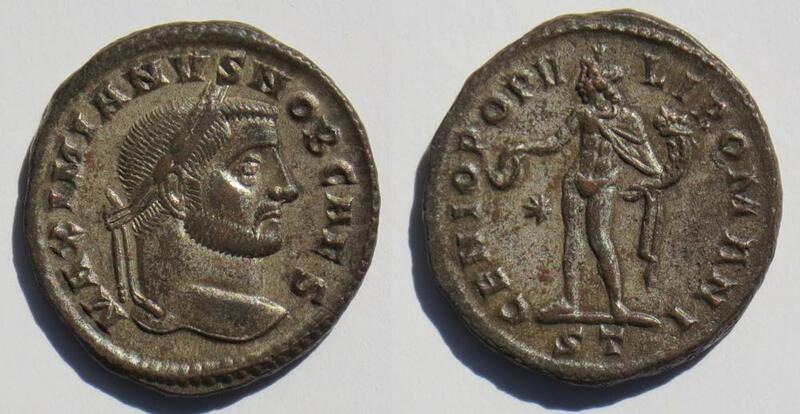 Caesar of the first tetrarchy of the Roman Empire (293-305) and Augustus 305-311. 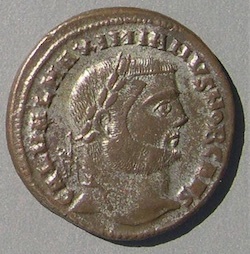 "Maximianus" for Marcus Aurelius Valerius Maximianus. 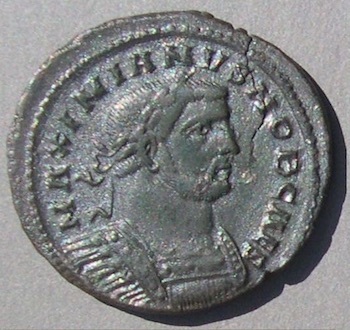 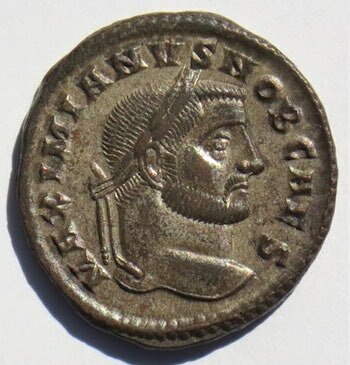 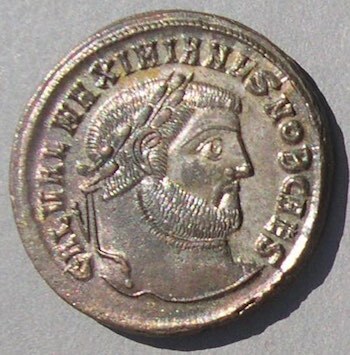 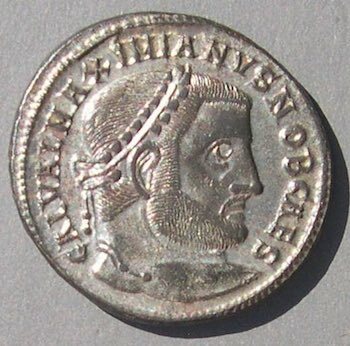 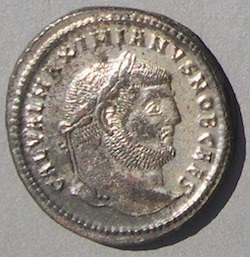 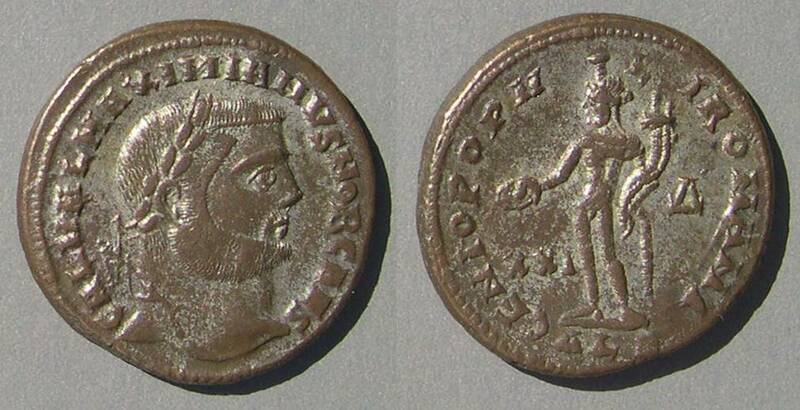 Maximianus was never Caesar on his coin legends and Galerius was Caesar for 11 years, so any coin with "MAXIMIANVS" as Caesar must be of Galerius. 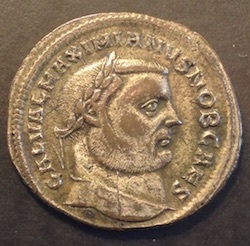 By the way, the emperor we call "Maximinus II" was Galerius Valerius Maximinus, and his coin-legends often differ from those of Galerius by only one easy-to-overlook letter. 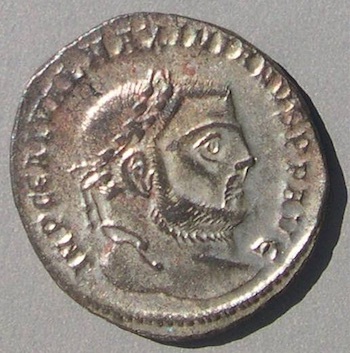 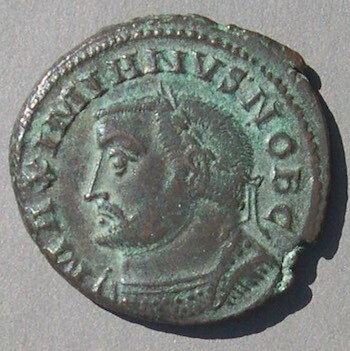 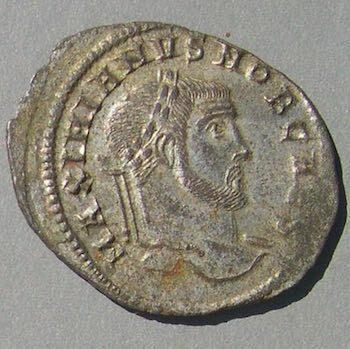 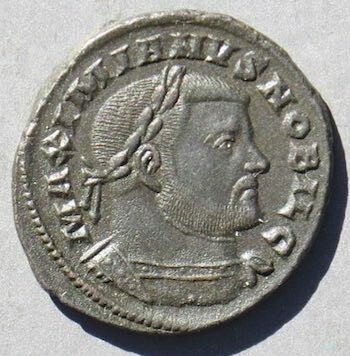 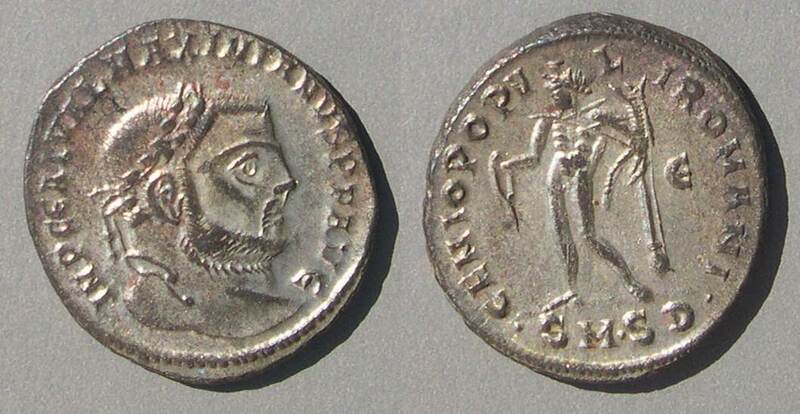 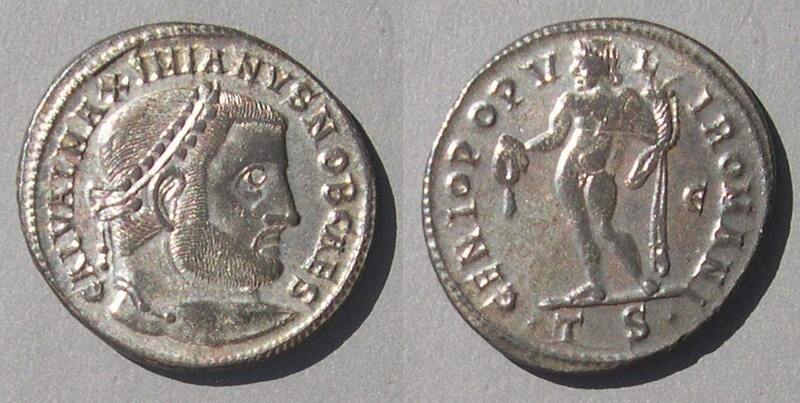 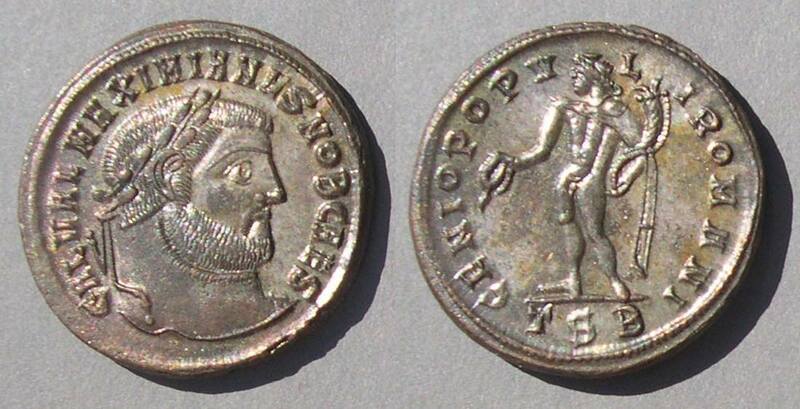 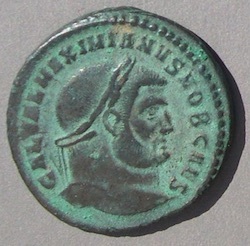 Coins of Maximinus II omit the A in MAXIMIANVS. 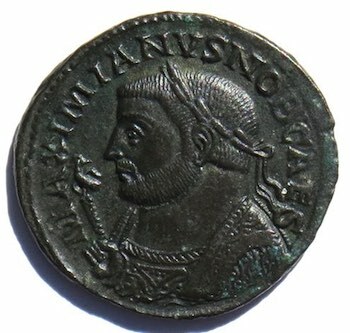 RIC London 15 "c. 300 onward"
RIC Lyons (Lugdunum) 166b "c. 301-303"
RIC Lyon (Lugdunum) 146b "c. 301-303"
RIC Ticinum 32b "c. 296-297"
RIC Rome 95b "c. 299"
RIC Serdica 12b "May 305 - 25 July 306"
RIC Thessalonica 20b "c. 298-299"
RIC Thessalonica 26b "c. 302-303"
RIC Antioch 59b "c. 304-305"
RIC Alexandria 31b "c. 300"
The revival of the mark "XXI" suggests Diocletian's Edict of Maximum Prices was accompanied by an attempt to assure the people that the coins had the composition introduced by Aurelian, "20 parts copper and one part silver" (nearly 5% silver). 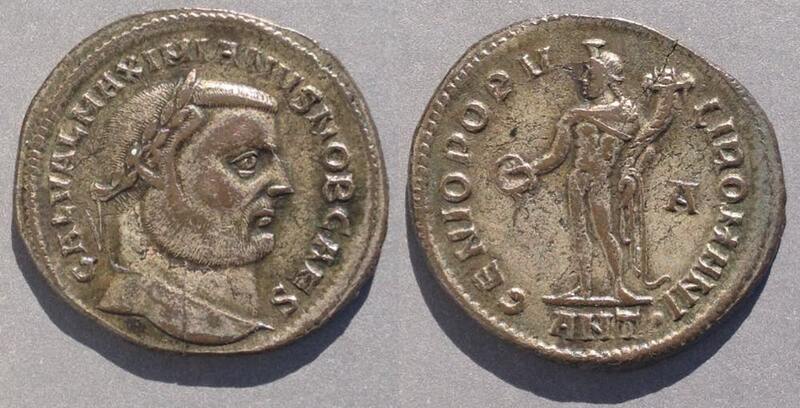 Since silver was worth 100 times the value of copper, every percent mattered to the intrinsic value of the coin. 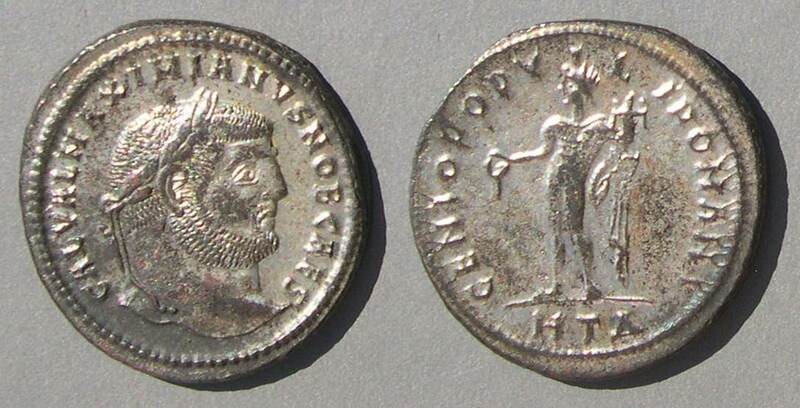 Go to the next page with other GENIO POPVLI ROMANI folles. 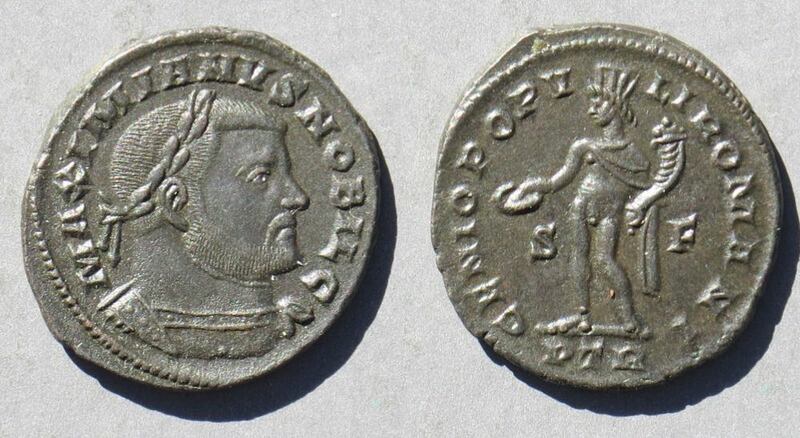 Return to a page with folles of Diocletian, Maximian, or Constantius.